The number of medical bills paid by paper check through the U.S. mail has even increased while payments for all other services have decreased dramatically. So what's taken so long for health care payments to go digital? Inertia explains a lot of the delay. (Bloomberg Business) — Dealing with medical bills, like waiting for the cable guy or buying a used car, has become a cliché of consumer exasperation. Everything from electricity and phone bills to tax returns and parking tickets migrated to electronic payments years ago, but America’s $2.9 trillion health care economy remains stubbornly stuck in the 1990s. The number of medical bills paid by paper check through the U.S. mail has even increased while payments for all other services have decreased dramatically. Medical payments are the only category to register an increase in paperwork since the start of the 21st century. It’s not just consumers who are paying by mail. Just 15 percent of commercial insurers make payments to medical providers electronically, according to a report last month from PricewaterhouseCoopers Health Research Institute. The largest insurers are usually the best at going digital, but Cigna, with 14.5 million customers, sends only 39 percent of payments electronically. That’s because many doctors aren’t signed up to receive electronic transfers, according to spokesman Joe Mondy. Aetna and UnitedHealth Group, in contrast, both say around 80 percent of payments are paperless. Hospitals, medical offices, and insurance companies need an army of workers to push all that paper, which is also frequently shuffled through middlemen like billing agencies and clearinghouses. One claims clearinghouse, Emdeon, which handles paper billing for many of its health plan clients, spent $87 million on postage alone in the first three months of 2015 — nearly a quarter of its total revenue — according to financial filings. All this bureaucracy pushed the cost of administering private insurance to $173 billion in 2013, according to federal data. But there’s also the human cost of sending people piles of indecipherable paperwork as they’re recovering from an illness or operation. “You pull your hair and you get frustrated. You don’t understand why it’s all paper and it’s all phone calls and you waste time and you get confused, and it’s all so broken,” says Tomer Shoval, chief executive and co-founder of Simplee, one of several companies trying to streamline medical billing. So what’s taken so long for health care payments to go digital? Inertia explains a lot of the delay. Doctors and health plans have to invest in technology to allow electronic payments, and smaller concerns — the solo practitioner or local health plan — may not think it’s worth it. 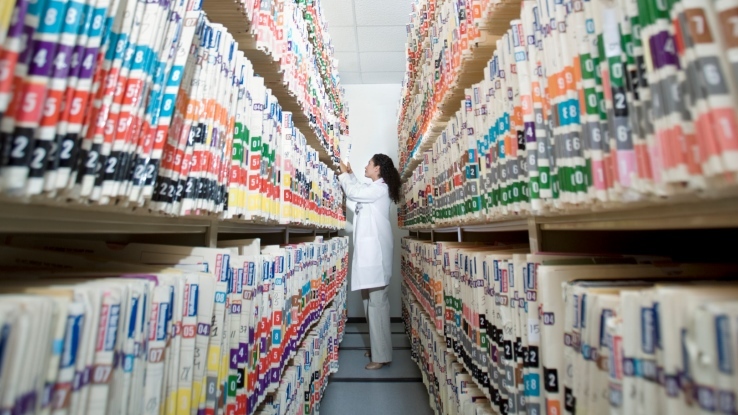 Many physicians have only recently switched to digital health records. And unlike other industries such as banking and telecom, where companies compete for customers on price, medical providers and health plans have long been able to pass the costs of their inefficiency onto customers with little consequence. Then there’s the fragmentation of the health system. Thousands of hospitals, physician offices, health plans, and other parties act independently and don’t have incentives to coordinate. Athenahealth, which provides health records software to 62,000 physicians, developed a system to submit claims to insurers digitally before patients leave the office, so doctors could determine how much patients will owe and collect it on the spot. But only a tiny fraction of doctors use the system, says Athenahealth chief medical officer Todd Rothenhaus, partly because only a handful of insurers participate. Some say insurers benefit from the complexity: The harder it is to collect on a claim, the more likely doctors will stop chasing payment. “Arcane rules create a situation where doctors decide it’s not worth their time to collect the money,” Rothenhaus says. There are some attempts to haltingly move the whole system to be more efficient. The Affordable Care Act limits how much insurance companies can spend on everything other than medical costs. If they spend too much premium money on administrative costs, they have to send rebates back to consumers. The law required health plans to be able to pay doctors with electronic transfers by January 2014. The government also requires doctors who treat Medicare patients to accept electronic payments, and three-quarters of Medicare’s claims are paid electronically. As health plans with high deductibles become more common, patients are increasingly responsible for a larger portion of their bills. The easier those bills are to pay, the less bad debt doctors write off. Startups are also trying to be part of the solution. Simplee works with more than 250 medical providers to make bills more understandable and easier to pay, while InstaMed is intended to connect providers, patients, and health plans on a secure network that can be used to settle payments electronically. Health plans pay a fee for the service, but co-founder Chris Seib says they make it up in savings on printing and mailing. “There’s just a straight business case to knock out paper, which there almost always is,” Seib says. Many hospitals have already learned this. UMass Memorial Health Care, with four hospitals and 1,700 doctors in Massachusetts, has moved most of its payments from insurers online in the last 10 years. It’s recently set up ways for patients to pay online too, and is experimenting with discounts for those who settle their bills quickly. John Salzberg, the hospital’s vice president for revenue cycle, calls it a win-win. “Anything that we can do to help make the process of understanding and paying their bills easier for our patients is good for them and good for us also,” he says. Only the post office loses. More than half a million medical secretaries and another 185,000 health records and IT specialists are employed in the U.S., according to data from the Bureau of Labor Statistics. The number of these workers has grown by 36 percent in the last 10 years, outpacing the ranks of health care practitioners, which increased by 24 percent. Medical offices sometimes send their claims through billing agencies that make sure the codes submitted to insurers match the care doctors provided, and maximize the amount they can bill for. Before they reach insurers, claims are often routed through entities called clearinghouses, which make sure the paperwork meets health plans’ requirements, bouncing claims back if, for example, a diagnosis code is missing a digit. There’s also been a 5 percent increase of claims being routed through clearinghouses than during the same period in 2014. That amounts to $550 for every American. That’s nearly five times the cost of administering government health programs like Medicare and Medicaid. The number doesn’t measure the overhead costs of doctors’ and hospitals’ billing departments, which they paid for out of their medical charges. One-third of health plans weren’t ready on time, according to a survey by InstaMed, a company trying to streamline payments.